CLICK THE “BUY” BUTTON ABOVE TO PURCHASE THIS DOMAIN RIGHT NOW. If you want to be found, you have to be on the internet. Whether you are running (or starting) a business, building your own personal brand or creating a family or special interest site, you want to make it as easy as possible for your visitors to find you. You can have the best content, cool graphics, wonderful products and compelling offers, but that will do you no good if you cannot be found. How does having the right domain name help drive traffic to your website? How much is a domain name worth? A domain is worth whatever someone is willing to spend on it. More than 80 domains have sold for $1,000,000 or more. Most domains sell in the $500 to $10,000 range unless they contain very valuable key words or have some other unique significance. The real question is not how much a domain name costs, but how much value the right domain name can bring to your business or organization. Three of the top values associated with domain names are Marketing, Branding and Investment. Marketing - The difference between a great domain name and other marketing expenses is that you are acquiring a permanent, valuable and potentially resalable brand, which helps future customers define you - as opposed to renting keyword traffic from a search engine. Are you paying for online marketing, radio or billboards? If so, keep in mind that whether you spend $100, $1,000 or $10,000 a month for this advertising, you retain no tangible asset at the end of that month. Once you purchase a domain name, it is yours to use as long as you keep your registration up to date (currently about $10/year). Everything you have put into that domain will continue to pay back dividends based on "Type In" traffic and your branding. Branding - Your brand is important and your domain name is the foundation on which your online brand is built. Your domain name is how visitors will find, remember, share and identify with your company online. A brandable domain should be memorable, relevant and easy to spell. Shorter is better. Having the .com extension is better. Because it is a domain name, it is unique - no one else can have the exact same one. Investment - Domain names can certainly be an investment. The Rule of Supply and Demand definitely applies to domain names. The supply of a specific domain is exactly one. Generally, if there is a low supply and a high demand, the price will be high. Therefore, if someone wants the domain you have, their demand will be proportional to their expectation of benefits derived from this domain. In other words, if someone really wants your domain, they cannot buy it somewhere else cheaper. They have to pay your price if they really want the domain name. One other consideration is Keywords. Maybe you already have a business that has great branding and a well-established website. Consider that ads featuring a generic domain name with an exact match to your product will perform significantly better than an identical ad featuring an alternative domain name. So? You can forward your "keyword" domain to your current website. This will help boost your search engine presence because you can use the keywords in the new domain to rank better for high competition keywords - this is especially helpful if your primary domain name does not contain any keywords related to your products or services. If you have any questions, send us a note through our Contact Us page. Find your domain in our inventory by searching or browsing categories. 2. Make an offer or buy now. Submit your best offer. Negotiate a price. Or select Buy Now (if there is a price). 3. Make a secure payment. After payment, domain is transfered quickly. Become the new owner. Launch your website on the domain or redirect the domain to your existing site. 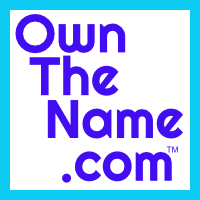 Copyright 2017-2018 OwnTheName.com is your source for great domain names.